This work was presented at Tuam Arts Festival 2011 and at the Phizzfest Phibsboro Arts Festival September 2012 and May 2013, and again at Draíocht for National Drawing Day 2013. 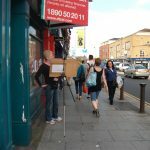 I have also carried out this work in the Natural History Museum, and on the street in Dublin. I take easel, paper and pencil and set myself up in a public place to draw. While I am drawing, I invite passers-by to come over and converse with me. It is a simple, straightforward exercise to bring art out of the private spaces of the studio and the gallery and place it in the public domain both for its making and its receiving.